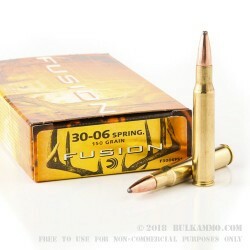 When it comes to selecting a proper round with taking down feral hogs and whitetail deer with your favorite .30-06 rifle, this load from Federal Premium is no brainer. 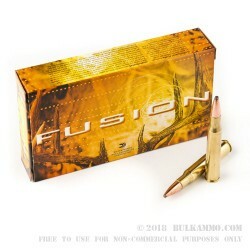 Cartridges from the Fusion lineup feature lead alloy bullets with electrochemically bonded jackets that won't separate from each other upon impact. That means that the soft point projectile is free to expand outwards while penetrating to a perfect depth to affect vital organs behind thick layers of fat, bone, and gristle. As a result, the mushroomed round will impart greater energy to a game target in order to achieve a quick and humane drop. In addition, the bullet is shaped with a boat tail rear that resists drag for greater stability in flight. 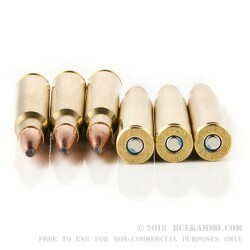 A projectile weight of 150 grains is a common choice for the .30-06 Springfield caliber and will match the ballistics and recoil impulse of numerous practice loads. 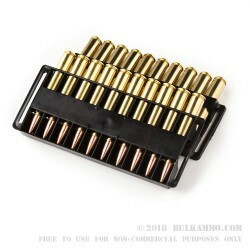 Each bullet has a reloadable brass casing crimped to its ribbed cannelure in order to prevent setback or dislodgment from ruining reliability or accuracy respectively. The casing is equipped with a non-corrosive Boxer primer at its base that won't affect the metal of your hunting rifle adversely in between hunts or zeroing sessions. A small dose of sealant prevents moisture from affecting the inside of the round for diehard dependability in field conditions.